Find hotel near Biblioteca Piloto Del Car ..
One of the best & biggest library in Barranquilla, the place is home to not just books but movies and music as well. It has a total of 173,000 items among which about 40,000 are bibliographies. Covering a wide range of topics such as literature, music, art history, urban planning, history, sociology, finance, legal sciences, philosophy, social research and more the Pilot Library is a place to literally get lost in. 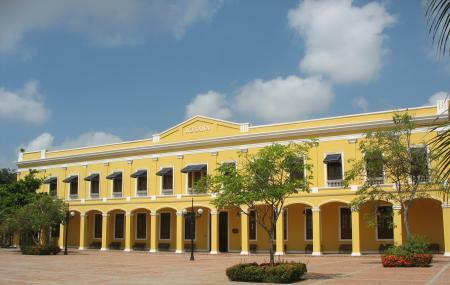 In 1999 Pilot Library of the Caribbean received the "Colombian Exemplary Award" in the category of culture, as the best institution. It also hosts events and talks regularly from time to time of imminent speakers. Maintain silence inside the library. How popular is Biblioteca Piloto Del Caribe? People normally club together Museo Del Caribe and Iglesia De San Nicolas De Tolentino while planning their visit to Biblioteca Piloto Del Caribe. Sitios abiertos con mucha vegetación y aire fresco con naturaleza. Sitio cultural público de acceso para todos. Ubicada en un hermoso patrimonio arquitectónico, la Biblioteca Piloto es un espacio ideal para la lectura y ademas cuenta con una amplia agenda cultural . El ingreso es gratuito.